From the Kennebec Journal editorial pages, 6/09/2008. We're all thrilled for Rob to receive this well-deserved reward! On Thursday afternoon, Rob Johnston Jr., will shed his work clothes, pull on what passes for a set of fancy duds and head south from Albion to Wellesley, Mass., where the veteran seedsman will receive a coveted award in the world of horticulture, the Jackson Dawson Memorial Award from the Massachusetts Horticultural Society. 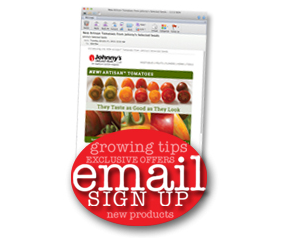 Johnston is the founder and chairman of Johnny's Selected Seeds, which he started in 1973 and led from $7,000 in sales in those early days to its current sales volume of $17 million. He has done this almost as an accidental businessman -- "I've never been motivated by money," he says. Rather, his interest is in the rarified world of plant breeding, what he calls "a big test in delayed gratification, a very disciplined and mostly tedious affair." Well, it may be tedious for Johnston, or at least a tedious process, but what his own personal interest has led to is real delight for the rest of us. From a wildly popular new kind of colorful swiss chard he developed (think sherbet colors) to the Bon Bon buttercup squash he bred (which merits eating for its name alone, but the taste is great, too), Johnston's perseverence has meant a richer world for gardeners, farmers and those of us who sit down to dinner every night. And with his work -- now carried on by the employees who own Johnny's -- he has proven that good taste and beauty can be good business, too, especially if it begins in good Maine dirt. Johnny's is a great company. I'm a native Oregonian myself temporaialy stranded in the midwest. Maine has become an adopted home to me. We love to travel downeast every chance we get. 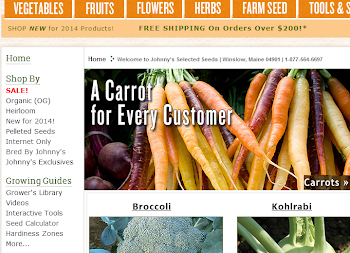 Johnny's seeds will make it to my garden this spring and will follow me when I retire back home to Oregon!